With my adventures in upholstery starring the channel back yard sale find chair all done and over, it was more than time to focus my efforts elsewhere in our living room remodel. 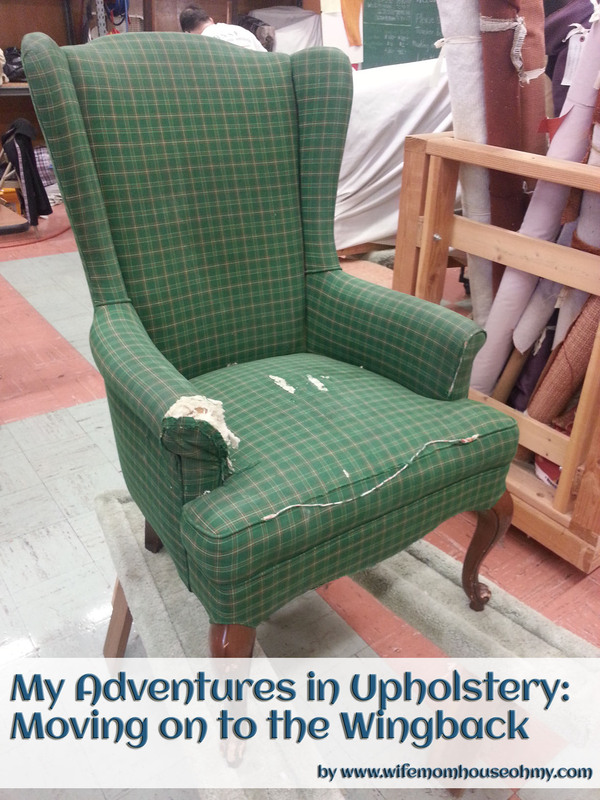 The wingback that my mother had been assisting on had stalled since our last class, so perhaps it was time I took a stab at it. Okay, the truth is I am bound and determined to have it done by Thanksgiving. You might be tempted to think, “a chair is a chair is a chair.” I’ll admit it. I did. Chair with arms that was upholstered seemed pretty similar or at least I thought their basic construction was…for the most part. And there is some truth to that but not. So for my next adventure I’m taking on its differences. Below are just a few of the challenges and new experiences I’m expecting. Oh my foe ply grip. Its back. No ifs, ands, or buts about it. I will definitely be enjoying my love hate relationship with ply grip. Its a fact of a wing back. The wings themselves have to have the ply grip to get a smooth finish. Remember the plumber’s tape that caused a few challenges along the way with my channel back? Well its gone. It is, however, replaced with a nice and sturdy piece of wood. At first this seems like an easy way to get smooth tight fits. But it does mean I’m going to learn new cuts and placements to keep it looking polished and hopefully perfect. Welt cords left me breathing a sigh of relief with my channel back. There were only two and they were straight with easy placement. Not so much with the gazillion welt cords that will be featured on the wingback. There are at least eight different welt cords and figuring out how and where and in what way to add them is like trying to put together a puzzle without having the final picture. And the arms…the arms are becoming my albatross. Trying to figure out the best way to put them on with the right amount of curve and with a pattern that makes sense has taken not one, not two, not three but four times so far. But more on that later. So the next adventure begins! Until next post!